Approximately 1 billion people on our planet have no electricity, and almost one out of three children (188 million) attend a school without electricity. Charlotte youth will help change some of that in this school year. With a shared global vision, Wells Fargo and the former CEO of Duke Energy, Jim Rogers, and his wife, M.A. Rogers, have made it possible to bring the “We Share Solar” program to 20 Charlotte-Mecklenburg schools during the 2018 – 2019 school year. “We Share Solar” is an innovative, educational program dedicated to inspiring students to learn about, build and share “solar suitcases” with the developing world. The suitcases are small, portable photovoltaic lighting systems, powerful enough to illuminate two to three classrooms and charge devices such as mobile phones or tablets. CMS teachers , along with Wells Fargo volunteers, are teaching students how to build “We Share” solar suitcases that will be deployed to Kenya. “I’m excited about teaching the ‘We Share’ solar program, because I am always looking for opportunities to bring real-world examples and experiences to my students. It is important to me for them to interact with science, not just learn it,” said Jazzmin Oates, earth and environmental science teacher at North Mecklenburg High School. Careers in science, technology, engineering and math (STEM] are projected to grow to more than 9 million between 2012 and 2022 — an increase of about 1 million jobs. In conjunction with the “We Share Solar” program, students will have the opportunity to learn more about STEM careers from leaders in the community during National STEM Day on November 8. 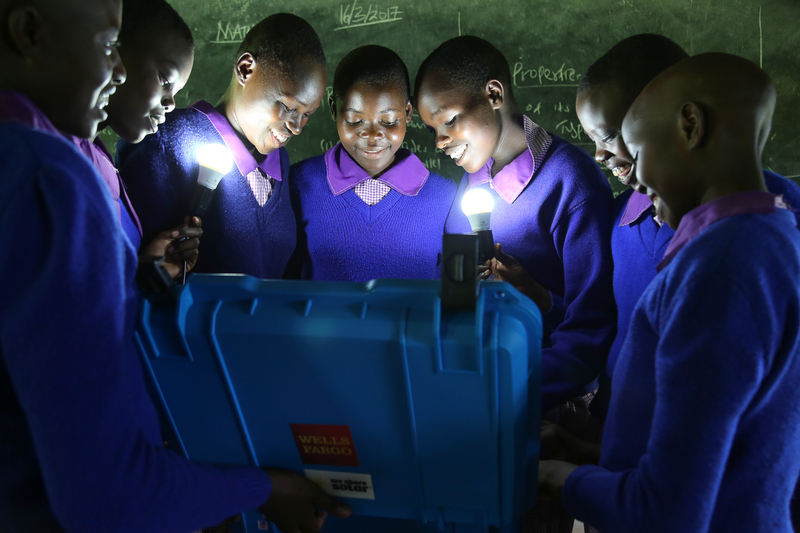 In addition, the Girl Scouts, Hornets’ Nest Council’s “Girls Go Beyond” program participated in a “We Share Solar” event in September, led by Wells Fargo’s Green Team volunteers, to build expansion kits which will provide additional lighting for the classrooms in Kenya. “We Share Solar” is the educational program of We Care Solar, a Berkeley, California-based nonprofit dedicated to bringing light and power to the developing world. Since 2013, We Share Solar has deployed more than 500 solar suitcases, benefiting 80,000 youth. More than 7,000 students from the United States have participated in We Share Solar programs. To learn more about We Share Solar, visit wesharesolar.org. Content provided by We Share Solar.